Here are the 10 Most Checked Out or 10 Most Wanted Books from last month, January 2019. These are the books that we sent most often to patrons from the shelves of NCLBPH. Note, all books were checked out at least 44 times over the month. The top book was checked out 57 times. 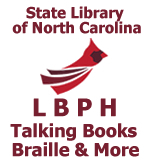 This entry was posted in Best Sellers, braille, collection, large print, News, talking books and tagged 10 most wanted, audiobooks, bestsellers, blind, book lists, books, digital, download, favorite books, libraries, library, most wanted, NC LBPH, nc libraries, nclbph, North Carolina, north carolina library, online catalog, OPAC, reading, reading list, talking books, top 10 list, WebOPAC. Bookmark the permalink.